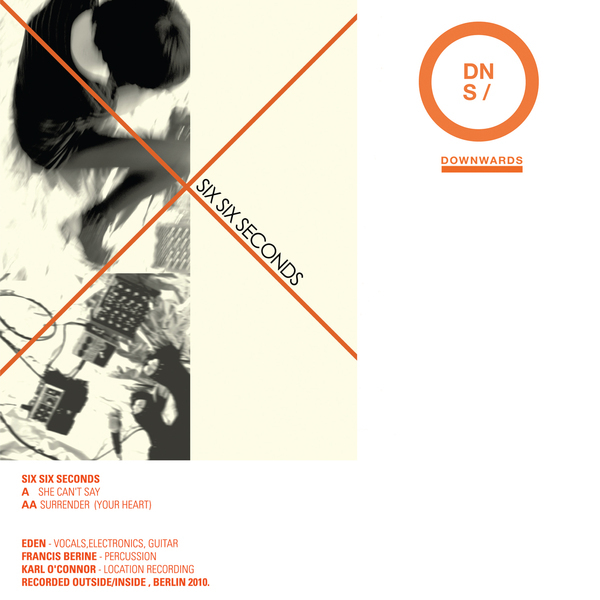 *Includes a Regis remix exclusive to Boomkat* Regis & Female's Downwards imprint indulges their taste for shoegaze drone pop with a pair of end-of-the-rope anthems from Six Six Seconds. The lineup curiously credits Karl O'Connor (Regis) with "location recording" next to the more typical, and apparent vocals, electronics, and guitar from Eden, and percussion accredited to Francis Berine. Unfortunately we can't tell you much more about the group, because we don't know jack-sh*t about them, but 'She Cant Say' conveys all you really need to know, kissing the sky with maudlin, Velvets style back beat and acres of distorted guitar lushly scraping at your cochlea like a billion tiny shards of diamond. The obvious reference point for the flipside 'Surrender (Your Heart)' is MBV, and it's conducted with enough reverence and visceral strength to be entirely worthy of the comparison. For those who like the taste of strong shoegaze pop, and can't resist the idea of it being shaped by Regis - this is a must. TIP!